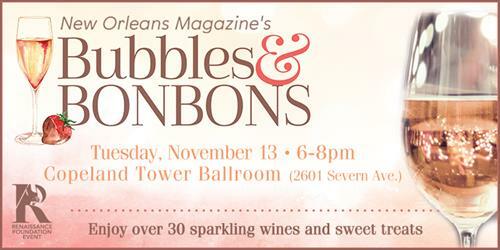 Join New Orleans Magazine as we “uncork” the inaugural Bubbles & Bonbons, a sparkling soiree. This effervescent event will feature a tasting of 30 plus sparkling wines from around the world. Indulge your sweet tooth with decedent delights from local bakeries and confection shops.